I’ve been baking our bread for a while now, mostly because of the crap that goes into commercial bread. No thanks. I’ll just use whole grains, honey or maple syrup, eggs and milk from my own critters. I’ve got three or four recipes that I can do in my sleep now. So now I’m working on making our own English muffins. The Thomas ones still have more crap in them than I want to eat, but I was intimidated by them. Who makes their own English muffins, really? I thought I’d try, and it turns out they are very easy to make and hardly take any time at all. And they actually come out better (chewier, better flavor) when you pop them in the icebox for rising and let them rise really slowly. I find that handy. So here is what I do. 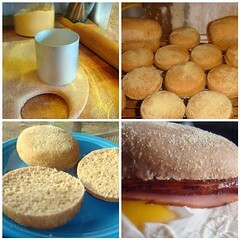 Homemade English muffins, getting better each time. Dissolve 2 teaspoons yeast in 1/4 cup warm water. Add 1/2 cup of room temperature sourdough starter. Stir in 1 cup warm raw milk, 1 tablespoon raw sugar, 3/4 teaspoon salt, 3-1/2 to 4 cups whole wheat flour. The dough will be stiff. Knead for 8 minutes with Kitchen Aid until smooth, adding flour as needed. Cover and let rise in the icebox overnight. Punch down and roll out onto a cornmeal sprinkled board to 1/2 inch thick. Cut out rounds and place cornmeal side up on ungreased pizza pan sprinkled with cornmeal. Oh, by the way, I take the scraps left over, squish it all together and put it into mini loaf pans. They really don’t work well at rolling out and cutting again, but they make really yummy little bread loafs with a really interesting fun texture. Cover and let rise until puffy. Bake at 275°F for 22 minutes. I wonder how much it cost me to make them. Hmmm. The flour, less than a buck. Well, to be honest, it was free. We got huge bags destined for the pigs from the food pantry, but they were perfectly fine, so I filled some buckets for me, too. The sourdough starter, more pennies worth of flour. Same with the microscopic amounts of sugar and salt. So probably less than a dollar all said. The time to make them is what I love. A couple of minutes to throw it in the mixer, then the Kitchen Aid does the work for 10 minutes. Throw it in the icebox overnight, and in the morning, roll it out and cut them — 5 minutes? Let them rise, then bake. Seriously, the time to make these really is minimal, and they are yum. Also, healthy.